If you look in the online dictionary, there is not really a difference between the definitions of expectation and expectancy. In fact, expectancy simply means to be in a state of expectation. And yet, somehow along the way, my brain has differentiated the two. I've deemed expectation as negative and expectancy positive. I look harshly at expectation, deeming it as having preconceived notions as what should be. I see it as a set up for failure and disappointment, neither of which I covet for my life. On the other hand, I've attached to expectancy words such as "light-hearted"and "hopeful waiting" for whatever God has to offer. I've deemed this as a good, palms wide open approach, where I will be happy with whatever I receive. But the differentiation is baloney. It has nothing to do with semantics and everything to do with the focus that I allow my heart to have. It's not so much about what I expect to happen, but about how I choose to prepare my heart for whatever is to come. If I don't prepare my heart, I will not have a light-hearted, hopeful, palms-wide-open approach to anything. I will say and pray one thing and yet live out something completely different. I think about Mary during her pregnancy and how God must have prepared her heart for what was happening in her life. I read the words in the Bible, sure that I must have missed somewhere when Mary cried out to God about all she had been through to carry this life and couldn't God at least give her a comfortable bed in which to labor? I'm pretty sure that something like this would have come out of my mouth. And I am pretty sure it's because often I have viewed my trials and my sacrifices as ways to try to earn things from God. And I am pretty sure it's because I've been so busy preparing my life that I've neglected the "prepare your heart" part. Oh, I have visualized not having high expectations and telling God that "whatever happens, happens" but I haven't actually lived this out. The proof is in my thoughts and the actions I carry out on a daily basis. You see, I think often about when I'm going to get the Christmas cards addressed. I think about how my house will be in tip-top shape for when my Dad and his girlfriend arrive. I think about my candle assortment and the food that I will serve for my Bible study gathering. I think about if the art piece I did for our mantel is good enough and why haven't more people commented on it? I wonder if my children will get up the gumption to participate in the Christmas pageant at church and if I've given enough to charity. See, I'm really good at preparing...things. And so on Christmas Eve as I sing "O Come All Ye Faithful" I'm expecting to feel this enormous sense of God and then...I don't. And I don't because all Advent season long, I've spent all my time preparing...things and I have neglected to prepare my heart. "Advent invites us not to be full. 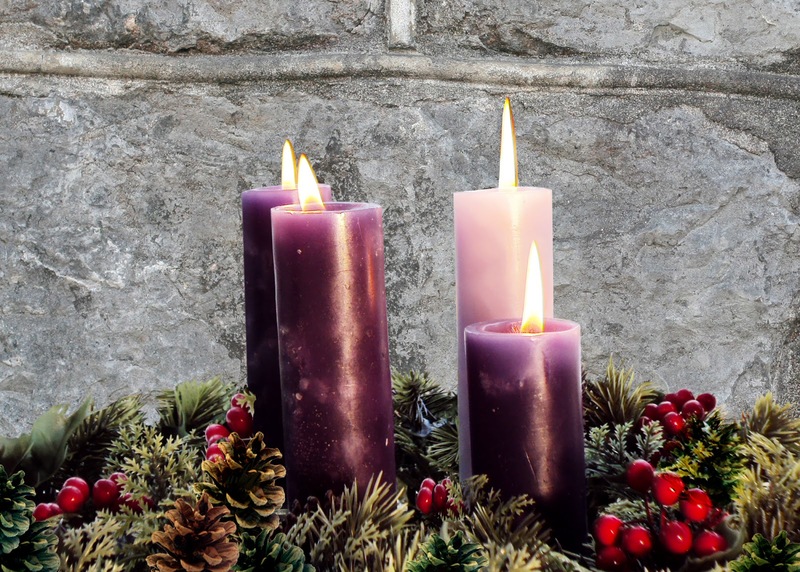 Advent invites us to be empty...so that when we celebrate Christmas, there is room for Jesus." Oh, yes. I have had it backwards all this time, trying to fill myself and everyone up that I have spent no time making room for the anticipation of Christ's birth and all that means for me everyday that I walk on this earth. It's not that the preparation of the things of Christmas is bad, but if I am going to expect to have a spiritual response to Christ's birth, I need to carve out time to sit still and wait expectantly for that big day to arrive. In the waiting, there is an invitation for God to come in and prepare me. In the waiting, there is room for Him to shift my priorities and my perspective. In the waiting, there begins the willingness to lay everything down. So whether I call it expectation or expectancy, what I really want is to be able to kneel at the manger and worship and be fully there. My party may fail, my house may not be super clean, the Christmas cards might be late, but if my heart is with Jesus, that is all that matters. I want that to be all that matters. What about you? How do you remember to value your relationship with Jesus during this Advent/Christmas season? Soli Deo Gloria is on Twitter! Have a favorite post? Share it on Twitter with the #SDGsisters! I am so happy to see your face here at Soli Deo Gloria. Did you know we have small groups? As SDG has grown, it started to lose a bit of the small community feel. As such, we have groups that visit each other and leave comments for each other on SDG days so that you don't feel lost in this big blog world. Would you like to be a part? If so, please email me at jenfergie2000@me.com. Also, if you are new here, please put "I am new" as your caption so that we might give you a proper welcome. Oh, you caught me at semantics! LOL - Expectancy is such hope growing word - like pregnancy. Expectation - between two people - it can cause a lot of conflict if you do not have the same expectations. Until I understand what God expects and line my thoughts and actions up with His expectations, all I get is frustration, failure - no peace at all, no unity, no one-ness with Him. Expectation is all about reaching and knowing and changing. As my boys grow, I have to continually change my expectations what I expect out of my family Christmas season - but like you say, carving that time out with God helps me line up with His expectations of what He wants me to get out of the Christmas season. Wishing you much blessing, much joy, much contentment and much being on the same page as the Father! I think what you said is so true -- l lining up our expectations with HIM is the key! You summed it up so well here:"but if my heart is with Jesus, that is all that matters." I always appreciate how you share your process...Praying you have a heart filled with Him and His joy this Christmas, Jen :) Thank you! You are so right -- He can speak in so many different ways. Here's to lingering in His presence today! What a great post, Jen. "It's not so much about what I expect to happen, but about how I choose to prepare my heart for whatever is to come." It's so easy to lose this focus. It amazes me when people say they can't hear God's voice. I always wonder could it be because the television and radio are drowning out His voice...a "still, small whisper"? Or, could it be they aren't reading His word - daily? And, no, books about Him are no substitute for Bible reading. Recently, I was invited to a "Bible study" that focused on eating. I know I'm old school, but I thought Bible studies were about God, Christ, the Holy Spirit and God's Word...? If we don't dig deep into the Word and Him, when those trials and tribulations come (and they WILL come! ); we'll be tossed and turned like a leaf in the wind. There is no substitute for Jesus. Your priest is a wise man and you are a wise woman to heed his advice. I think you are on the right track, Sandra. I never heard God's voice before I became a Christian, and learned to pray and especially to listen. Looking back, there were many times He was speaking, but I didn't recognize it for what it was. I think it might be like learning what a radio is for the first time. When you hear the music, you don't know or understand where it's coming from. However, when you learn that you just have to tune in to the right station to hear the message, you will hear it. What you write about reminds me of the reading we are doing in our teen youth group. We are reading The Cross Centered Life, by C.J. Mahaney. The author talks about Stuart, who continues to add spiritual spinning plates to his life—both good and important, until a "dangerous shift takes place in his mind and heart. What God had intended to be a means of experiencing grace, Stuart had changed into a means of earning grace. Instead of being a further expression of his confidence in God's saving work in his life, his spiritual activities became spinning plates to maintain." And then: "God wants to rescue you from the futility of plate spinning." Between your post and Mahaney's admonition to stop being a plate spinner, I am taking a closer look at how I spend my time and how I am preparing my heart this season. If it is full of and focused on too many other things, there is no room at the proverbial inn for Jesus, and that just won't do. Thanks! It is SO easy for our focus to get completely out of whack. So glad that we have a community that keeps us sharp. Beautiful post, Jen! We tend to get so caught up in preparing the superficial elements of the celebration that we forget to prepare our heart to receive the peace, joy and love He so longs to give us. He is all we need! Thanks for hosting & God bless! Yep, I can see myself in this post as well. I've felt the let down on Christmas day that I slaved to get all the cooking and decorating and shopping done, but still felt something missing...Christ! duh. Thank your for this post!! I love how you use the word "slaved" here -- let us be a slave to Christ and no other! Was on the road last night and did the unthinkable--linked from my phone and ran. So glad I've got some time now to sit and read your thoughts here and check in on some sisters! I love this Jen--expectancy isn't just waiting for whatever happens. It's about waiting for the good our loving Father has promised us. I love how you honor our community, Nancy! Jen--you know Laura Boggess at The Wellspring, yes? Her post was about the same exact thing...Must be the Holy Spirit speaking to us all, eh? I just went to visit her and you are right -- God seems to be whispering the same things into our hearts. Joy Bearer or not so much?